I need a graphic similar to the attached to accompany my Web site that says 'All software products are at your fingertips'. 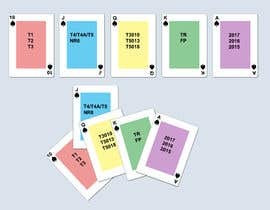 - Each card will have one of the Royal Flush suite card letters: A, K, Q, J, 10 (Royal Flush is the winning combination of cards in Card playing): So the first card on the right will have A at the top left and also A on the bottom right. The second will have K, etc. The cards need to be spaced properly. - No words or banners on the background, we only need the fingers and the cards. - The color of the background could be navy blue. - See if you can use horizontal placing of 'Prior' and second line 'Years' so it is easier to read. Do not use full capital letters. - The color of the card letters A, K, Q, J, 10 could stay red but the products should be bold dark blue and bigger. 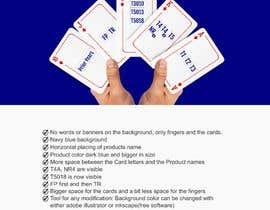 - Leave more space between the Card letters and the Product names i.e. place product names a bit lower. - Card A: Try placing T1, T2, T3 in the middle of the card horizontally. Do it only if it looks ok.
- T5018 is not fully visible. NOTE: You can put the Q products on Card J and FP, TR on Card 2 if it makes it easier due to the way the space is. I may have a use for the original image you send me with the banner. But first change the cards as described in my previous comments. Then change the banner to read 'All tax modules at your fingertips' in two lines as you ha it. Do not emphasize the 'fingertips' and remove 'the Know more'. No words or banners on the background, we only need the fingers and the cards. The color of the background could be navy blue. The color of the background should be easy to change with which tool?). dark I cannot tell right now as I only see the left side. See if you can use horizontal placing of 'Prior Years'. Also: Allow bigger space for the cards (and a bit less space for the fingers?) so the product names will be readable in our web site presentations. The color of the card letters A, K, Q, J, 10 could stay red but the products should be bold dark blue and bigger. Leave more space between the Card letters (i.e between 10 and Prior Years) in all cards. I cannot see the A card but I am assuming the products would be in the middle as T1, T2, T3 and it would have the A on the right end corner also. are you there? I am working on this. can you please explain this line ". I cannot see the A card but I am assuming the products would be in the middle as T1, T2, T3 and it would have the A on the right end corner also." No words or banners on the background, we only need the fingers and the cards. The colour of the background could be navy blue. The color of the background should be easy to change with which tool?). dark I cannot tell right now as I only see the left side. See if you can use horizontal placing of 'Prior Years'. Also: Allow bigger space for the cards (and a bit less space for the fingers?) so the product names will be readable in our web site presentations. The color of the card letters A, K, Q, J, 10 could stay red but the products should be bold dark blue and bigger. Leave more space between the Card letters (i.e between 10 and Prior Years) in all cards. I cannot see the A card but I am assuming the products would be in the middle as T1, T2, T3 and it would have the A on the right end corner also. text and banner are just for mockup purpose. I will only provide you the main image. hello, how are you doing? I am waiting for your comments. just describe the changes you want to see in the design more clearly then I will update it accordingly. Thanks. For some reason The first time I saw it, it showed only part of it. hey there, do you want something specific in background ?